This article is part of a series on climate change, the effects of fossil fuels, and ways towards a sustainable future. You can make your voice heard on these issues. Alaska’s own Senator Murkowski is the Chair of the Senate Energy and Natural Resources Committee. Tell her to act on climate change by signing our petition, sending a letter we’ve written, or contacting her yourself. Her office can be reached at 202-224-6665, by mail at 709 Hart Senate Building, Washington, D.C. 20510, or through this contact form. Oil companies are wreaking havoc on the environment. Cutting corners in dealing with waste has polluted environments from America to the Amazon. Oil spills have ruined ecosystems on seas and shores. And the fundamental aim of these companies – to extract oil from the ground to burn for energy – is leading to climate change and its slew of disastrous consequences. Surely, the responsibility of a government to serve its people includes protecting the planet they inhabit. So why have governments done so little to address climate change? 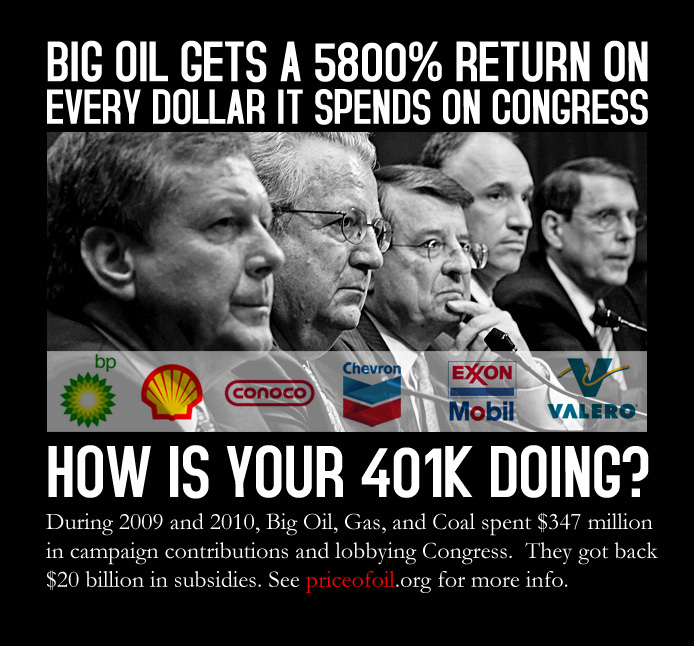 Why do they continue to support and subsidize the destructive fossil fuel industry? Well, that has something to do with the power of the companies involved in that industry. These companies are able to use the utterly ridiculous amounts of money they control to manipulate politicians – so that they can make more money, profiting off the Earth’s pains. They use their power to attack credible science, bribe foreign governments, and tinker with the legal system so they can continue to pollute the world. Big oil’s money is also being put to use in attempts to manipulate the science behind climate change. Legal funds supported by oil money have dug through records to try to defame reputable climate scientists, incurring lawsuits for their use of slander. These funds serve as fronts for oil corporations to make tax-deductible, anonymous donations towards skewing science. Donors Trust, another of these organizations, paid hundreds of thousands of dollars to Dr. Willie Soon, a researcher who denies man-made climate change. Dr. Soon, who often neglects to cite where his money comes from, contrary to publishing standards, claims that changes in the sun’s energy are responsible for global warming. Many scientists agree that his methods and data are wildly out of date, yet he is cited time and again by climate-denying senators. 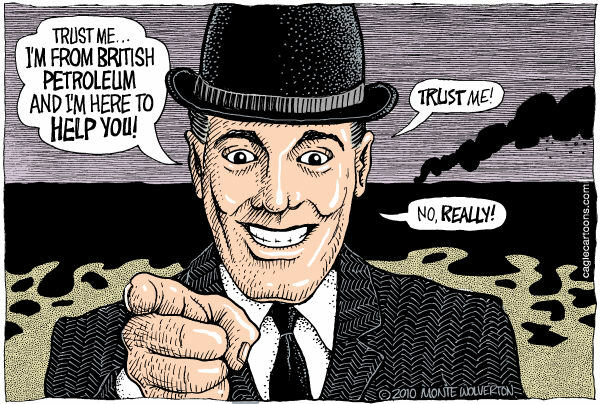 Big Oil buys not only politicians, but also scientists, in their efforts to remain on the throne of the energy kingdom. Big oil is using their political clout to not only allow themselves the freedom to pollute, but also to prevent renewable solutions from being implemented. By this point, it likely surprises no one to hear that these companies get involved in some corruption. Transparency International made this fact perfectly clear by conglomerating global surveys and handing the crown of most corrupt industry to oil and gas. They proved to be the best and most regular bribers of governments. Some of these bribes went to Muammar el-Qaddafi, when he demanded that oil companies, in exchange for continued access to Libyan oil fields, help him settle his debts with the families of people his military had murdered. In 2011, the Securities and Exchange Commission tried to crack down on corporate bribes to foreign governments. The American Petroleum Institute wasn’t having it, however. They used their massive lobbying power to ensure they wouldn’t have to disclose whatever bribes that oil companies were making. These bribes allow them to decimate environments – from Ecuador to the Niger Delta, big oil has skirted regulations and shown no regard for the ecosystems they operate in. Occasionally, in America and abroad, these companies are penalized with fines. But another advantage of being filthy rich is that they can take these fines as operating costs – they are usually a lot less expensive than actually cleaning up their acts. Big oil is using their political clout to not only allow themselves the freedom to pollute, but also to prevent renewable solutions from being implemented. Even if these companies followed regulation and ethical business practices, they would be destroying our climate. But their power is such that they have no need to do either of these things. The corruption and environmental degradation that goes hand in hand with these companies' operations should trigger anyone’s moral radar. In order to protect the planet we inhabit, we cannot continue to allow the fossil fuel industry to unjustly control so much political power. We must stand up together to tell our elected officials to stop listening to the selfish desires of these companies and instead take action to address climate change.